“I’D LOVE IT”: WHITLEY BAY JOYS — 2011, 2012, 2013 . . . ! 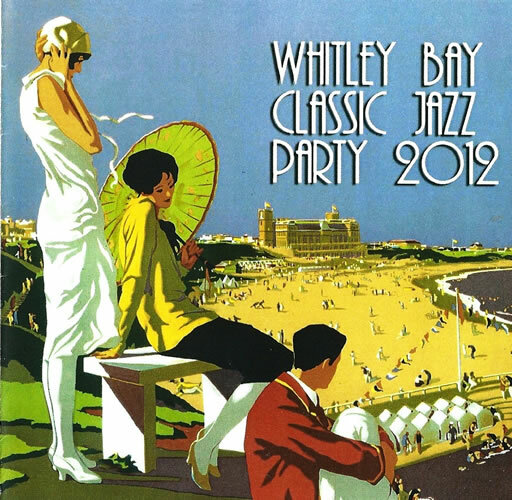 I’ve attended the Whitley Bay Classic Jazz Party for the last few years . . . and always had an extraordinary experience . . . meeting and hearing players who don’t often make it to the United States, including Jean-Francois Bonnel, Bent Persson, Frans Sjostrom, Michel Bastide, Nick Ward, Norman Field, Spats Langham, Michael McQuaid, John Scurry, Jason Downes, Matthias Seuffert, Enrico Tomasso, Jacob Ullberger, and two dozen other luminaries — even musicians from the US I don’t encounter often enough, such as Andy Schumm, Josh Duffee, and Jeff Barnhart. The 2012 Jazz Party is sold out, but if you want a portable audio sampling of the 2011 Party, I urge you to snap up a copy of this limited edition CD . . . only 100 copies were produced. The CD was recorded live at the 2011 Party by Torstein Kubban, and features this stellar assortment of players: Michel Bastide, Mike Durham, Bent Persson, Andy Schumm, Enrico Tomasso, Andy Woon, Alistair Allan, Kristoffer Kompen, Paul Munnery, David Sager, Steve Andrews, Bernard Anetherieu, Michel Bescont, Jean-Francois Bonnel, Norman Field, Mauro Porro, Matthias Seuffert, Paul Asaro, Jon Penn, Keith Nichols, Martin Seck, Jean-Pierre Dubois, Phillippe Guignier, Keith Stephen, Martin Wheatley, Roly Veitch, Christian LeFevre,Henry Lemaire, Bruce Rollo, Phil Rutherford, Debbie Arthurs, Josh Duffee, Richard Pite, Nick Ward, Raymond Grasier, Mike Piggott, Frans Sjostrom, Caroline Irwin, Cecile McLorin Salvant. And the songs? Nothing “psychological,” as Ruby Braff once said. I’D LOVE IT / I GOT RHYTHM / SWEET SUE / I DON’T KNOW IF I’M COMIN’ OR GOIN’ / COTTON CLUB STOMP / WOLVERINE BLUES / VIPER’S DRAG / SINGIN’ THE BLUES / THANKS A MILLION / STARS AND STRIPES FOREVER / WHEN YOU LEAVE ME ALONE TO PINE / SOUTH / SNOWY MORNING BLUES / BLUE AND SENTIMENTAL / ALLIGATOR CRAWL / FRONT AND CENTER / OH, BABY! / WILDFLOWER RAG / CORNFED / BUGLE CALL RAG — a nice mix of small bands, big bands, three-tenor extravaganzas, vocals, novelty showcases . . . not a dull minute in the seventy-eight contained on the CD. You can purchase a copy of the souvenir CD by visiting here. Your purchase helps fund future Classic Jazz Parties, but the price of the disc isn’t prohibitive. and you can visit here to see the “themes” being mulled over for 2013 — because, as you may already know, the CJP is remarkable in its intense focus. Some jazz parties get wonderful results by merely putting a group of musicians onstage and saying, in effect, “You have 45 minutes to do whatever you’d like.” The CJP arranges its musicians thematically — so there might be a Jelly Roll Morton trio, a Lionel Hampton small-group session, a recreated McKinney’s Cotton Pickers, the Rhythmakers come again, and so on. It’s not a dry historical lesson — more like a pageant of jazz history, alive and exuberant. So, I encourage you to do “all of the above” if possible. You’ll love it. Or them. Even though I think he finds it mildly embarrassing, I hold the cornetist / trumpeter / bandleader / jazz scholar / occasional singer Bent Persson in awe. He isn’t the only brassman who has studied and emulated Louis Armstrong — but when he plays, young and middle-period Louis comes alive, gloriously. In this set at the 2011 Whitley Bay Classic Jazz Party (on Friday, November 4) he and an all-star band evoked some music from 1929, when Louis was often accompanied by the Carroll Dickerson and Luis Russell — a period of his career that doesn’t always get the attention it deserves. The band had Bent, Andy Schumm, and Michel Bastide on trumpets; Kristoffer Kompen, trombone; Michel Bescont, Matthias Seuffert, and Mauro Porro, reeds; Martin Seck, piano; Mike Piggott, violin; Jean-Pierre Dubois, guitar; Richard Pite, sousaphone and string bass; Debbie Arthurs, drums; vocals by Rico, Cecile McLaurin Salvant, and Michel Bastide. THANKS A MILLION (Elin), with both Rico and Bent invoking and evoking Louis, makes me feel so grateful for this set of music.